One of the most daunting tasks a young outboard technician encounters is sorting out all of the different models throughout the years. Because many outboards are only used a few times each summer, they may last for 30 years or more. Twenty year old technicians may find themselves working on outboard motors that are ten years older than they are! A timeline of the changes and improvements to a manufacturer's product line can put everything into perspective for a technician. This increased knowledge can have a tremendous effect on a technician's self-confidence. if looked at from a point of engine design changes and the year of these changes. They can be broken down into four distinct generations. Prior to 1958 all Johnson/Evinrude engines were either a one or two-cylinder. In 1958 the V4 was introduced. The first V4 was rated at 50 horsepower and the basic engine design was manufactured from 1958-1968 reaching a pinnacle of 85 horsepower in 1968. This engine is most commonly identified by its single 2-barrel downdraft carburetor. the 1966 model year this was the first Johnson/Evinrude outboard to produce 100 horsepower. Externally the 1958-1959 V4 can be identified by an square(ish) engine cover with spark plug access doors. The 1960-1968 V4 can be identified by a more rounded engine cover without doors. All 1958-1968 models have exhaust gases that exit through the cavitation plate (through-the-prop exhaust wasn't available on the V4 engines until 1969). -1961 First year for battery ignition (magnetos would continue on some models until 1967). -1967 First year for breakerless ignition, 100 hp only. -1968 First year for mounting the distributor under the flywheel (no more belt driven distributors). In 1969 the Johnson/Evinrude V4 engines were completely redesigned from top to bottom. Since 1985 (when the V4 loopcharged engines were introduced) these outboards have been commonly called the "crossflow" V4 engines. Although manufactured from 1969-1997 they received no significant design changes after 1984. The 1969 V4 crossflow engines were sold in two sizes, 85 and 115 horsepower. The pinnacle would be the 140 horsepower manufactured from 1977-1984. The first and most obvious is the modern, sharp edged, triangular engine cover that emphasizes the low profile of the 90 degree crossflow V4 engine (a contrast to Mercury's tall inline six cylinder). The second is the new one piece gearcase with through-the-prop exhaust and rubber hub propellor (no more shear pins for the V4). The third is the two side-draft 2-barrel carburetors. None of the crossflow V4 engines were ever equipped with fuel injection, only carburetors. -1969 First year for the V4 with a electric/hydraulic shift gearcase with one mechanical cable running from the control box to the outboard (the throttle cable). -1973 First year for the V4 with a mechanical/hydraulic shift gearcase with two mechanical cables running from the control box to the outboard (throttle and shift cables). -1973 First year for distributor-less ignition (one coil per cylinder with timer base and sensor). -1978 First year for the V4 with a full mechanical shift gearcase. -1984 First year a V4 used the large V6 gearcase and large diameter prop. no significant design changes after 1995. The 90 degree V4 loopcharged engines have come in different horsepower ratings between the 120 hp (smallest) and 140 hp (largest). The introduction of the loopcharged V4 in 1985 brought the Johnson/Evinrude "V" engines into the modern age of two-stroke engine technology. A crossflow two-stroke has one transfer port delivering the air/fuel mixture to the combustion chamber from the crankcase. A large and heavy deflector is designed into the top of the piston to direct the air/fuel mixture to the spark plug and to keep it from being discharged directly out of the exhaust port. A loopcharged two-stroke has three transfer ports, one in the back (similar to a crossflow), and one on each side of the cylinder. The three transfer ports direct the air/fuel mixture to the spark plug and away from the exhaust port without the need for a piston deflector. This is accomplished by casting the cylinders with very precise contours in the transfer ports. The addition of two extra transfer ports in a loopcharged engine also feeds larger quantities of the air/fuel mixture to the combustion chamber. This provides a dramatic increase in power over a crossflow engine. The main drawback to a loopcharged engine is the cylinder size. With two extra transfer ports cast into the sides of each of the cylinders, each cylinder is much wider. The loopcharged V4 engine is much taller than the crossflow V4 engine. The bore spacing on a loopcharged engine is 4.750 inches. The crossflow engine is 4.125 inches. For identification purposes, this is also the distance between the spark plugs. -Removable transfer port covers on the crossflow engines versus non-removable transfer port covers on the loopcharged engines. -The exhaust port cover is removable on the crossflow and is cast into the block on the loopcharged. -The loopcharged V4 engines have four individual one barrel carburetors. -All 90 degree V4 loopcharged engines come with the large V6 type "O" gearcase and large diameter prop. In 1995 the V4 outboards were completely redesigned. Between 1958 and 1994 all V4 Johnson/Evinrude outboards were manufactured with a 90 degree angle between the two banks of cylinders. Taking advantage of modern aluminum casting techniques, Johnson/Evinrude was able to design and manufacture a very compact 60 degree V4 engine for the 1995 and newer models. 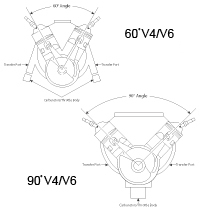 The 60 degree V4 has very few parts that will interchange with the 90 degree V4. The biggest difference between the 90 degree and the 60 degree is the location of the carburetors/throttle bodies. While a traditional outboard engine will have them mounted in front of the engine, over the crankcase, the 60 degree V4 has them mounted on the side of the engine, over the transfer ports. A new small mechanical shift gearcase was introduced on the standard length engines. The long shaft engines use the large mechanical shift gearcase. When a marine technician encounters a 1958-1968 V4 outboard, common sense and a basic understanding of a points style (magneto or battery) ignition will get them through the ignition system. Mechanical aptitude will get a technician through the relatively simple fuel system. The gearcases on these models are very easy to rebuild (as long as you remember to feed the wires through before pulling the magnets out of the electric shift gear case). Perhaps the most common outboard ever manufactured is the 1969-1997 V4 crossflow Johnson/Evinrude engine. In production for 29 years these are as basic as an outboard gets. Having the correct service manuals and a basic understanding of breakerless ignitions and fuel systems will get a technician through just about any problem. One special tool is needed to rebuild the gearcase: a pinion height measuring tool. This tool can be used on all 1969 and newer V4 and V6 outboard gearcases and 1978-newer OMC and Cobra Sterndrive gearcases. Definitely a tool to invest in! The 1985-1998 Loopcharged 90 degree V4 Johnson/Evinrude outboards are also very common and are serviced almost as easily as the earlier V4 crossflow engines. As with the crossflow engines, a service manual and a basic knowledge of breakerless ignitions and fuel systems will get a technician through most tasks. Rebuilding the mechanical shift gearcase is relatively simple with a pinion height measuring tool. almost a necessity for diagnosing the ignition system or fuel system. The gearcase is a traditional mechanical shift design and rebuilding it is relatively simple with a pinion height measuring tool.